The Kickstarter campaign for these little weirdos is live. Flesh and Green are up for grabs along with some other goodies and the opportunity to claim some future colorways. The store is open! Just look up and click the “STORE” button. Trash Bag Bunch XL figures, stickers, pins, shirts, and Trash Bag Bunch series 2 mini figures are all available to order. Pre-orders placed in the next couple weeks will go out with the first wave of shipping in April, and then there will be continuous shipping after that. Here are some of the photos I have received from the factory documenting different stages of the production process. Most of the toys are finished and packaged at this stage and I’m arranging shipping to the US. They will soon be distributed and available for a wider sale. I’ve worked closely with the factory to ensure quality control and color matching. They have done a brilliant job and have really given these toys the attention they deserve. It’s great to get these behind the scenes shots from the factory and to be able share some of them. To all the friends, family, strangers, strangers who have become friends, and fellow toy fiends who backed the Trash Bag Bunch XL Kickstarter, I want to extend a very gracious “THANK YOU.” Thanks for the support, the trust that I would execute this, and the continuous positive feedback. Things are trucking right along, it’s time consuming and hard to keep pace with updates! 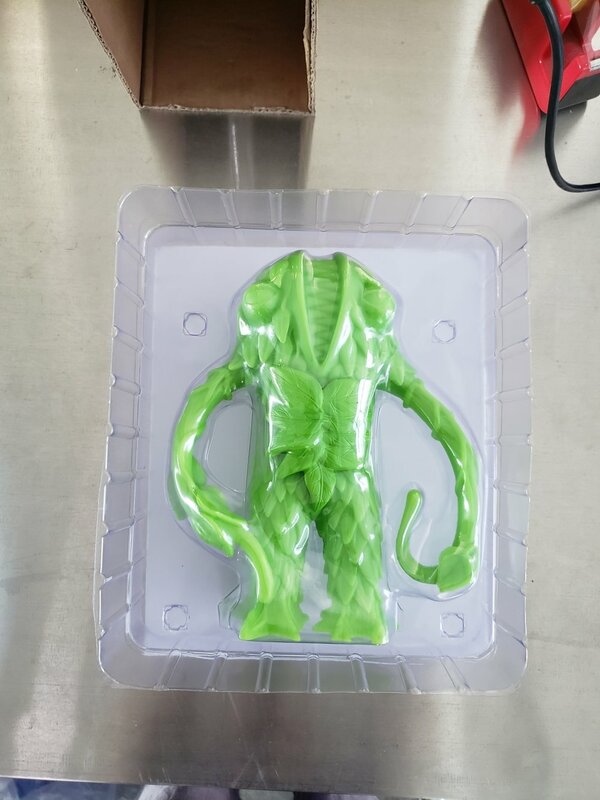 Some blank green and blank glow units arrived in time for Designer Con and they are beautiful. It was great to have a presence at Dcon and show the toys to the world and also preview some upcoming prototypes. I met a handful of Kickstarter backers, which was so nice, and was able to connect with many other talented artists. Such a good convention! The details and colors on these came out beautifully. These will be available at Designer Con 2018 and fulfillment of the pin reward tier from Kickstarter will also start in just a couple months! Here are some cool photos from the factory. These are the wax copies used to make the metal molds. 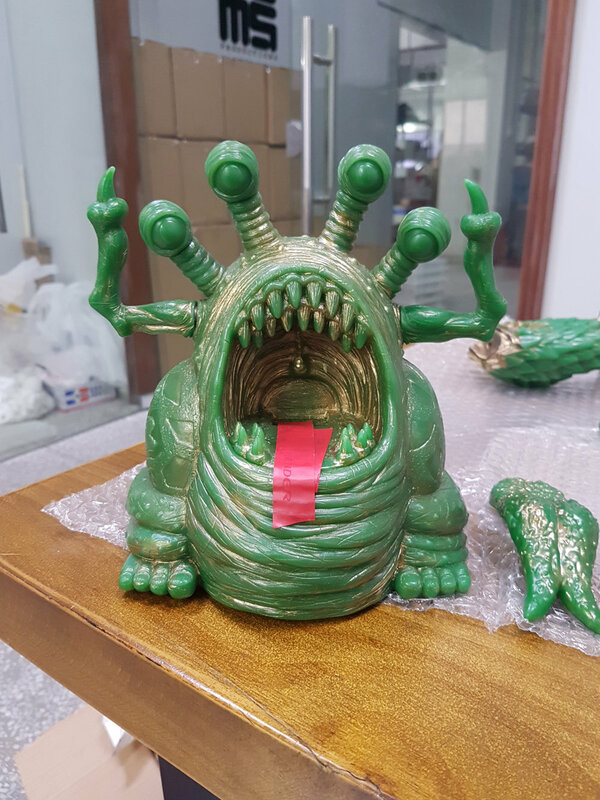 Once the factory has made their molds, all the vinyls can be pulled with the same details and no degradation to the mold itself. As you can see, the waxes are beautiful and well polished with all the details transferred from the prototypes. These dudes will be hanging out at the Tenacious Toys booth #234 at Five Points Fest in NYC this weekend June 2-3. Drop in and check them out! Sticker and Enamel pin set giveaways! You've got two chances to enter to win a set of the 7 stickers and 6 enamel pins. Just check out the giveaways on the Last Resort Toys Facebook and Instagram feeds. Share the love for your entry to get some free stuff! Click the pic for the Kickstarter page! Half way through the campaign and over half the money pledged so far, but still a ways to go! Please keep up the support, and thanks! Some of the best toy blogs and news sites on the web are helping spread the word about TBBXL! 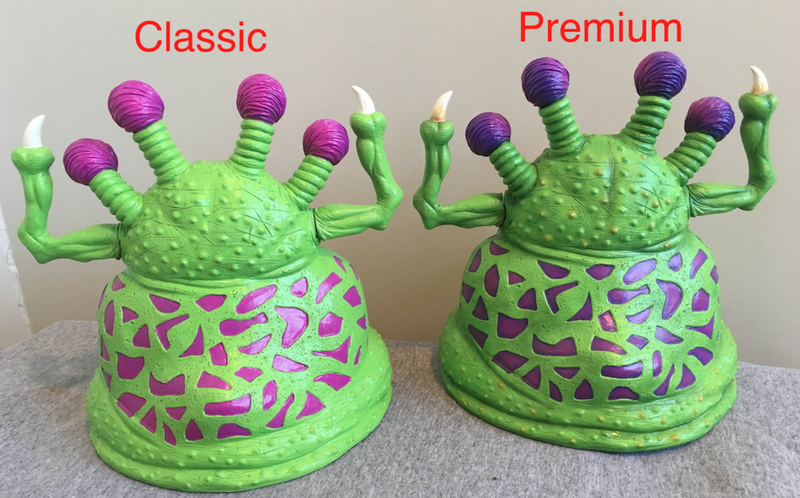 Big thanks to SpankyStokes.com, ToysREvil, Tenacious Toys, and Action Figure Insider for sharing the the Trash Bag Bunch XL Kickstarter! Look at it...it's beautiful! Time to shove the baby from the nest! Spread the word! The Kickstarter will be live as soon as I hear back from Kickstarter! Don't worry, I'll post about that too. I've spent DAYS building the Kickstarter and creating the reward tiers and doing math and whatnot--so much involved! The final surprise I've been keeping up my sleeve is a re-release of the 12 Trash Bag Bunch mini figures only released in TBB series 2. If you're a fan of this line--then you already know what these are. Time to complete that collection! Coming in at the low end of the Kickstarter rewards are a selection of stickers. Seven designs in total: Trash Bag Bunch classic logo, Trash Bag Bunch XL logo, Last Resort Toys logo, Liceplant, Muckoid, Skuzbeast, and Stink Buzzard.